Are Fast Foods Causing Obesity in America? How Does a Diet of Fast Food Impact the U.S. Health Care System? The ease, convenience, affordability and addictive taste of fast food have made it a staple in the standard American diet. Whether it's burgers, tacos, wings or dogs, you risk a high health cost when you regularly eat fast food in lieu of fresher, unprocessed options. Fast-food consumption correlates with obesity, type-2 diabetes and heart disease. The medical cost of obesity alone was $147 billion in 2008, reports the Centers for Disease Control and Prevention. Investing a little time now in shopping for and preparing fresh foods can save you from future health complications and the costs associated with them. Much fast food offers up large, high-calorie portions without a lot of nutrient density. Refined grains, sugar and saturated -- even trans -- fat are abundant in fast food, and they correlate with a higher risk of type-2 diabetes. After examining the eating habits of people who live in Singapore, researchers found that those with a heavy intake of fast food had a higher risk of developing type-2 diabetes and coronary heart disease, reports a study in a 2012 issue of Circulation. Eating too much sugar and refined carbohydrates causes your body to pump out extra insulin, a hormone that helps to covert the sugar -- or glucose -- from these foods into energy. If you overeat sugar and carbs, your body's production of insulin increases so much that you become immune -- or resistant -- to it. You don't process the glucose properly, and the excess glucose leftover in your blood triggers inflammation and type-2 diabetes. The excess calories from fast foods stored as fat, often around your belly, which further promotes inflammation. People who ate fast food two or more times per week had an increased risk of type-2 diabetes and obesity, reports a 15-year study published in the Lancet in 2005. A diagnosis of diabetes comes with a substantial financial cost. The American Diabetes Association reported that the total costs associated with diagnosed diabetes was $245 billion in 2012. A total of 90 to 95 percent of diabetes cases are type 2. Type-2 diabetes is preventable with lifestyle changes, such as minimizing fast-food consumption and exercise, which could significantly reduce long-term medical costs. About 78.6 million adults in the United States qualify as obese -- that's more than one-third of the population, reported the Journal of the American Medical Association in 2014. Obesity-related conditions include type-2 diabetes, as well as heart disease, stroke and certain types of cancer. Joint problems, sleep apnea, gallstones, high blood pressure and high cholesterol also accompany obesity. Most fast food is high in calories, with minimal nutrients. And "super-sizing" a meal increases the likelihood that a fast-food meal will make you overeat and gain weight. Having a fast-food restaurant within 0.1 mile of a school resulted in a 5.2 percent increase in teens' obesity rates, and pregnant women who lived within 0.5 mile of a fast-food restaurant were more likely to gain excessive weight, reported a study published in a 2010 issue of the American Economic Journal. Although the Food and Drug Administration has called for a ban on the use of trans fats -- man-made fats that enhance foods' shelf life and taste -- some fast-food restaurants still use them and can do so legally until summer 2018. Trans fats are dangerous because they greatly increase your risk of developing cardiovascular disease and stroke -- they raise your levels of bad cholesterol, or low-density lipoprotein, and decrease your levels of good cholesterol, or high-density lipoprotein. 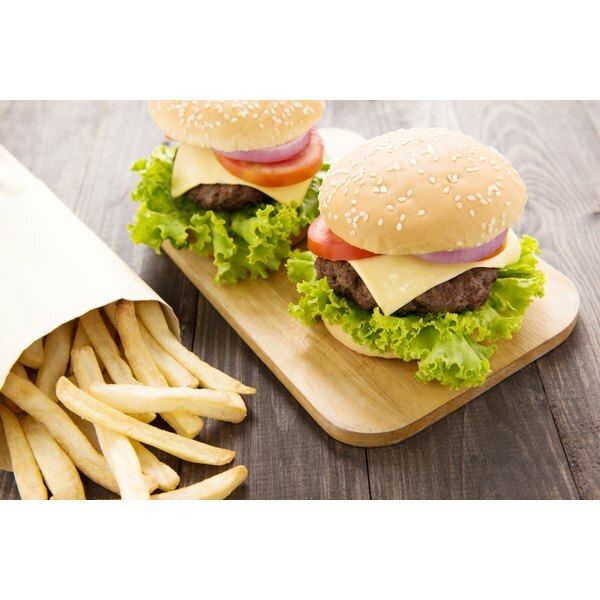 Restaurants like to use trans fats because they're cheap, palatable and reusable for frying. Another potentially harmful ingredient prevalent in fast food is sodium. Consuming fast food makes it easy for you to easily overshoot the recommended sodium intake of 2,300 milligrams per day. A diet with too much salt has implications for high blood pressure, stroke and kidney health. Typical fast-food fare contains significant amounts of sodium -- a single-patty burger contains 475 milligrams of sodium, a slice of cheese pizza contains 574 milligrams and a ham and egg breakfast biscuit contains almost 2,000 milligrams. Fast food tends to be low in fiber and many of the crucial vitamins, minerals and phytonutrients you get from fresh vegetables, fruits and whole grains. If fast food crowds out these healthier options, you may be missing out on the nutrition that supports your best health. The easiest way to reduce the impact of fast food on your health and future medical costs is to skip the drive-through. Opt for a homemade meal consisting of lean protein, fresh vegetables, whole grains and low-fat dairy instead. Sometimes, though, you just don't have the energy or time to make a meal at home. If you choose to eat fast food, ask if the nutrition information for the menu is available, and look for options that are lower in calories, fat and sodium to still eat the best you can. Many fast-food restaurants offer healthier fare, such as grilled sandwiches, whole-wheat buns, vegetable salads and fruit cups. Oatmeal and yogurt parfaits are more healthful breakfast options, compared to pancakes or biscuit sandwiches. An alternative to fast food is a quick stop at a grocery store to pick up a rotisserie chicken, a prewashed bag of salad and whole-grain rolls. If you're fearful that replacing a fast-food diet with a whole-foods eating plan will break the bank, a 2002 issue of the Journal of the Academy of Nutrition and Dietetics found that following a lower-calorie, nutritious diet did not increase financial costs, and thus budget should not be a barrier to healthful eating. National Heart Lung and Blood Institute: What Are the Health Risks of Overweight and Obesity?